Okay, so I either did something horribly offensive and scared everyone away or you lurkers out there are la-zy. No comments whatsoever? No one* has any suggestions about Lady Eleanor or a cable pattern? No one has anything at all to say? Perhaps you would like some more interesting things to read, or perhaps I've scared you all with how much holiday knitting I've been doing? You get what you ask for, so if my musings are not to your satisfaction, please share with me what you'd rather I write about! In any case, for lack of anything else, I'll have to fill in this post with the usual business. 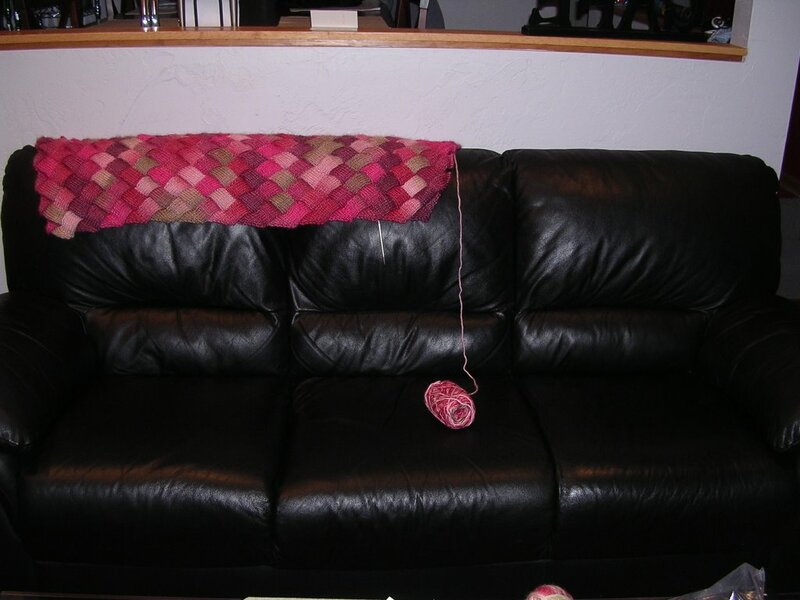 I haven't touched Lady Eleanor since Tuesday, when I worked on her furiously through the Stars Hollow Knitathon (go take a look at Crazy Aunt Purl's last two posts for screen shots). Last night I was too busy finishing up a sock for J, as I knew I was near the toe and wanted to start up the second one to take for my lunch hour knitting today. Sorry, can't show you the picture, J might peek. It's a charcoal gray color, and I've combined two Knitting Vintage Socks patterns -- manly patterns, that is. Tonight it's back to Lady E, who I'm hoping will see her completion by the end of the weekend. On a more interesting note, I do have this unusual local news story to share with you, right out of the WTF?!?! files. Not only is this unusual for the area, but the house where this critter is found is one that' s on my way to work every day -- good thing I keep my car doors locked! *To her credit, Jenn tried to leave a comment but encountered technical difficulties (what would Blogger be without them, right? ), so she sent me an e-mail with a great suggestion. I nearly ordered the book last night, Jenn, but then thought I'd bettter take a look at it first before spending the $20 or however much it is. Happy Monday, or, as one of the local news channels had on the screen this weekend, First Day of Buck. (A brief pause for translation for those of you who don't live in, as they say, Western Pee-Ay: today is the first day of firearm buck season. Which means many offices and schools are closed today so that folks can go out and shoot Bambi and his friends.) I'm guessing someone was a little hasty in typing in that headline and forgot a key word. At this point, I have seven more tiers to add before the final triangles to complete the pattern as written. However, I think I've mentioned that I have plenty of yarn (six more skeins beyond what you see here), and I think I'd like this to be a little longer. I'm not quite sure about just how much longer to make it, as I can already tell that a good blocking will add significant length. What do you think? I don't necessarily feel like I need to use all the yarn -- I'd like to use any leftover to have some fun with felting (maybe some pillows or slippers). 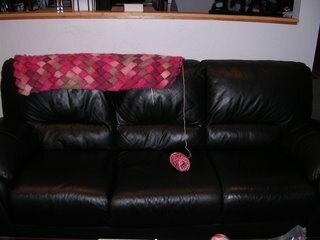 Is there anyone out there who's blocked this yarn and can give me a sense of how much it will grow? 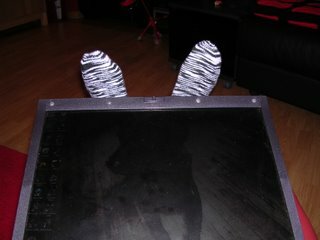 As a reminder, I'm using Paton's Soy Wool Stripes (SWS). Even if you can offer no advice on Lady Eleanor, you don't get off the hook that easily. 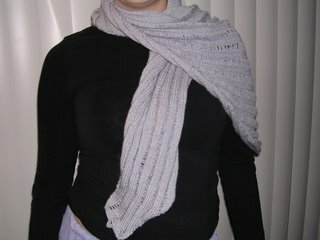 I also need advice on my mom's scarf! I probably won't be starting it until right around Christmas (it may wind up being my car project) and it won't be a holiday present, but I'd like to start gathering some ideas. 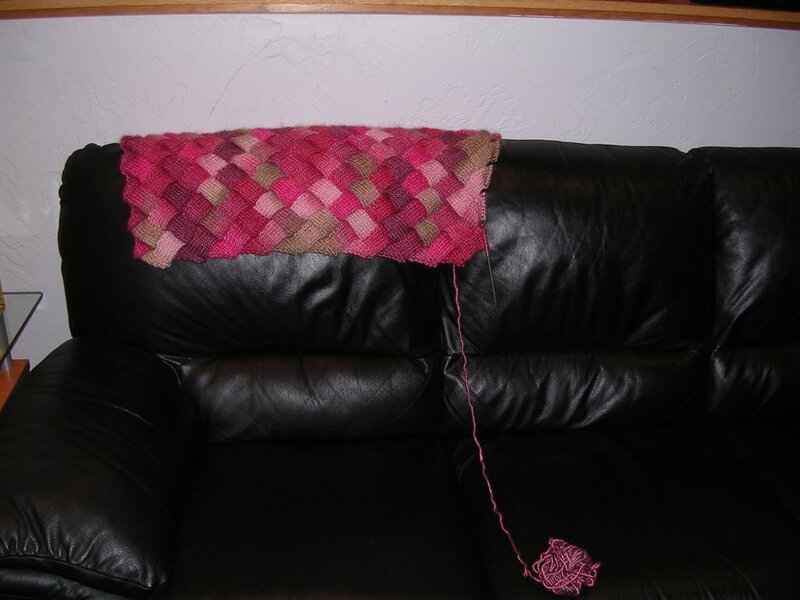 It will be similar to this scarf in that it'll be a long, primarily stockinette tube, but the cabling will appear at each end rather than running the length of it. I'm looking for a complicated-ish cable pattern, not too big (it'll have to fit on half the stitches of the scarf or less, as the tube flattens on itself). It will also have to be vertically symmetrical -- and by that I mean the same from top to bottom as bottom to top -- as I'll be knitting one end from the edge of the scarf toward the center and the other end from the center to the edge. Anyone have some ideas? Or do you know of any good resources for cable charts or diagrams? Much appreciated! 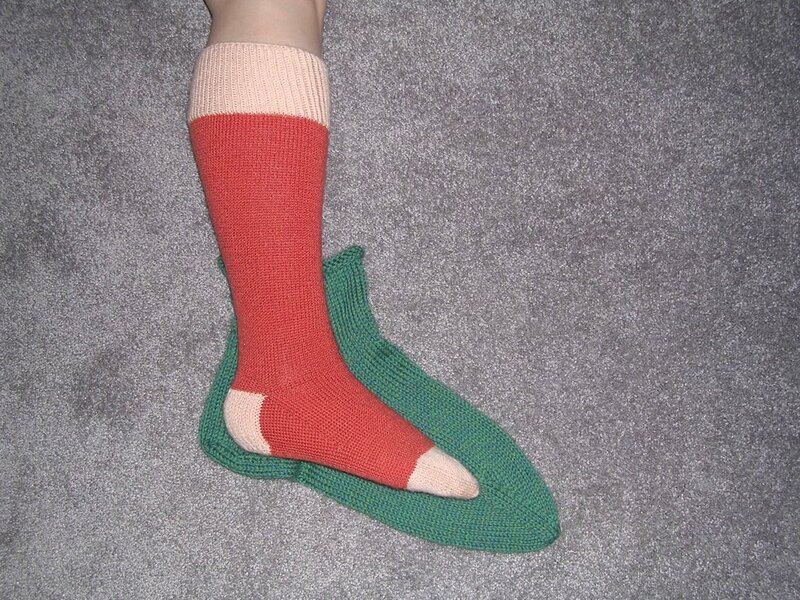 I'm off to scavenge for dinner and work on a sock. Such is my life. Mods: I did a straight BO rather than the picot BO called for in the pattern. I needed a quick project to provide some instant gratification, and these fit the bill. 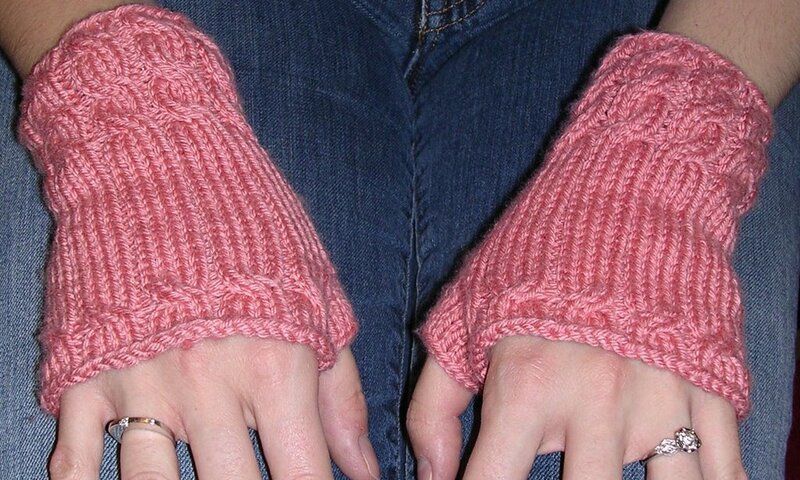 I justified the knitting time as a trial run, as I wanted to see if this would be a good project for a gift for the FBIL's girlfriend (who happened to see them and noted that she liked them when she came over for dessert). I wore these around yesterday and, aside from one snide comment by a guy friend (something to the effect of "Madonna called; she wants her gloves back"), they were a big hit. As for the rest of the list, Lady Eleanor is still there and shows no sign of going away any time soon. I scrapped the big stocking for the family friends and decided to go back to my regular tradition. For many years, I've taken them an ornament. For the first several years, it was something cross-stitched, but for the past two it was something knitted (you might remember last year's mini sweater). So I thought I'd make a pair of felted elf shoes -- basically small socks with pointy toes. The first one is done, the second is forthcoming, and a pattern will be published here for anyone interested. I think it's about time I updated my Flickr albums, don't you? I'll just take care of that now. Anyone else remember that song from one of the Muppet movies? Ahh, takes me back to my youth. But this is a knitting blog, not a Muppet blog, so back to the knitting content. I am making excellence progress on the holiday knitting. This is mostly due, I think, to the fact that J has been out of town and I've been knitting pretty much every minute of the day when I'm home, from the 20 minutes in the morning when I drink my coffee to when I'm in bed watching TV right before bed. 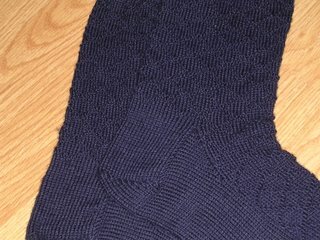 This evening I finished up my father's socks right before dinner, and they're blocking as we speak (as I type?). At this point I am more than halfway done with the repeats as called for by the pattern, but the piece only measures about 27 inches in length. I know that a good blocking will increase the length a bit, but as I have plenty of yarn (I'm only through a third of what I bought) I may do some extra tiers. 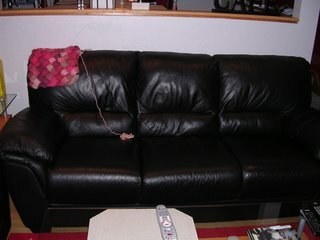 My FMIL is petite and thin, but I'd like this to be long enough for her to wrap herself up in it. So, let's review the holiday knitting list, shall we? J comes home tomorrow! At some point in the next 36 hours or so, I will cast on for the second Pumpkin Pie sock (my planned Thanksgiving Day knitting project). When life get really crazy, and there are days when you don't see if the sun ever comes out, it's nice to know that there are still things you can count on. Like last night, the regular monthly knit night at Barnes & Noble. Jen and I were joined by Amanda, a newcomer to our group, who I don't think quite believed us about 40 guy. We told her about his normal routine, and how we'd seen him every knit night for the past six-ish months, but she still looked dubious. Mods: Many. 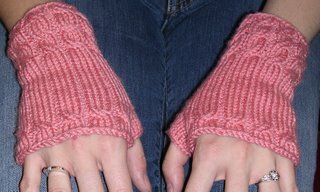 I really only followed two parts of the pattern: 1) I knit the cuff to be three inches long, as called for, and 2) I knit the foot and toe to be the recommended 1.3 times the length of the recipient's foot. Thank goodness for what felting does. 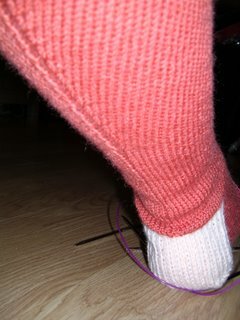 When I was in the middle of kitchenering the second toe, a knot formed in the tail of the yarn without me noticing, resulting in my tugging on the yarn a little, resulting in my pulling all but about three stitches off the needles. I couldn't really figure out where I was or which stitches went with which needle, so I just made sure I went through every stitch at least once and the toe was closed up sufficiently. 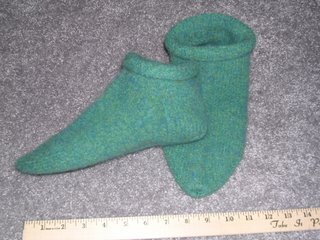 Had the sock not been intended to be felted, I would have frogged and redone the toe, but fortunately felting hides many flaws. Honestly, now you can't tell the difference. So that's another item to cross off the list. I also finished the first of my dad's socks last night, and put another two tiers on Lady Eleanor. And the weekend is coming! My Sockret Pal strikes again! I don't know who she is, but I want her to be my new best friend. This gal clearly has been paying attention to me and selected swag that was so me. See that gorgeous yarn on the right? The color is brighter and more luminous in person, a gorgeous glowing teal that my pal dyed just for me. She calls this colorway Peacock Feather, because it made her think of the deep shimmery teal shades in peacocks' plumes. In her note (which was on top of all the goodies, so I read it before peeking under the tissue paper), she casually mentioned that she thought the yarn would be good for making myself a Shetland Triangle from Wrap Style, which I'd said in my questionnaire way back in September was a pattern I was dying to knit. I swear, I wasn't fishing -- but what you do you think was underneath the yarn?! All I can say is, it's a good thing J isn't home, because when I saw the book I just screamed with glee; had he been home, he would've thought I'd cut off my finger or something. There was also a great little zippered case inside -- that my pal SEWED HERSELF (she's clearly craftier than I) -- that was filled with even more goodies: locking stitch markers, a blue(!) Chibi (how did you know that my tapestry needles just disappeared, Sockret Pal? 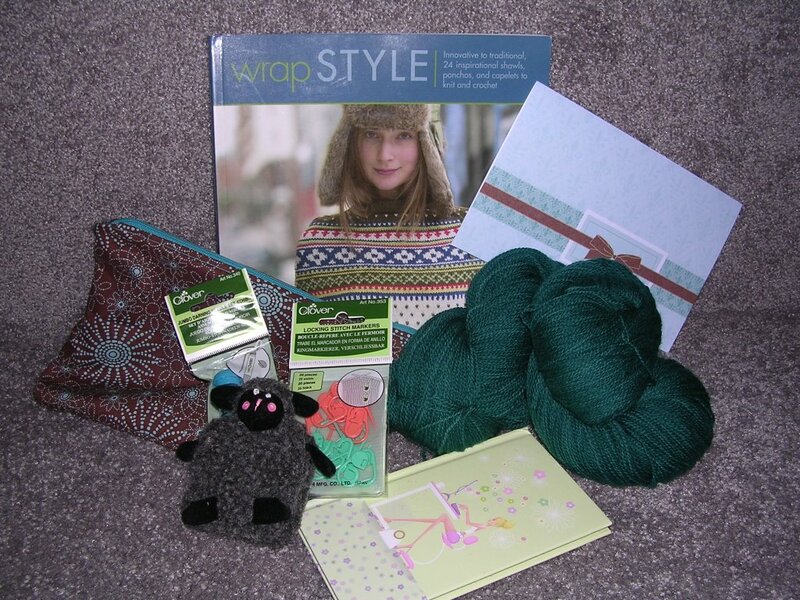 ), a chic girly address book, and the most adorable gray sheep tape measure! Sockret Pal, thank you so, SO much! You clearly put a lot of thought and time into putting this package together and I love everything in it! I'm just so impressed by your sewing skills -- I can't believe you even found matching teal thread! It will make a great bag for me to store all my notions, which I've desperately needed as I keep loosing things (just ask the fiance about the attack of hysterics I had when I couldn't find my thread scissors). As soon as I finish up the holiday knitting, the first thing I am going to cast on for is a Peacock Shetland Triangle! Mods: None, as far as the pattern was concerned, unless you count my complete disregard for gauge and needle size. 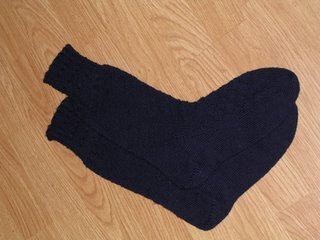 Next up, progress on the to-be-felted gigantic socks that will be slippers for the future brother-in-law. 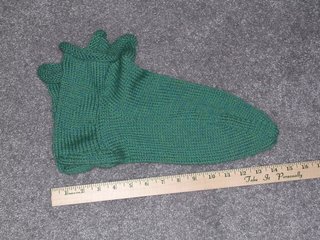 One sock is finished, and in case you think I'm exaggerating about the size, here you see one of my feet (in my recently completed Pumpkin Pie Sock) for reference. I should've had the foresight to put a ruler in this shot as well. To get a sense of scale, I'll tell you that my feet are 9.75" long from heel to end of toes. That big green sock? A whopping 14.3" long. After weaving in the ends on this one, I immediately cast on for the second. I've got about two more inches of foot to knit before I hit the toe, so I estimate these will be ready to felt by tomorrow at the latest. Other items on the list are also coming along. I've just started the heel of the first of my dad's socks, and I bought yarn over the weekend for the big stocking for the family friends. I've not cast on just yet for the second Pumpkin Pie Sock, but that will happen in the next week as it's the only project I can knit on Thanksgiving (because the recepients of the rest will be there). Before I go back to the Giant Green Feet, here's your friendly monthly reminder that this Wednesday (11/15) is the monthly knitting night at the Waterworks Barnes & Noble. It appears that at least one-third of the usual group will be unable to attend due to an unfortunate intersection of vehicle troubles and Morse code (you'll have to ask her to explain), but the usual characters are likely to be there along with the rest of us friendly knitters. Won't you please come and join us? Pretty please? What a week it has been, and there's still another day left to go. 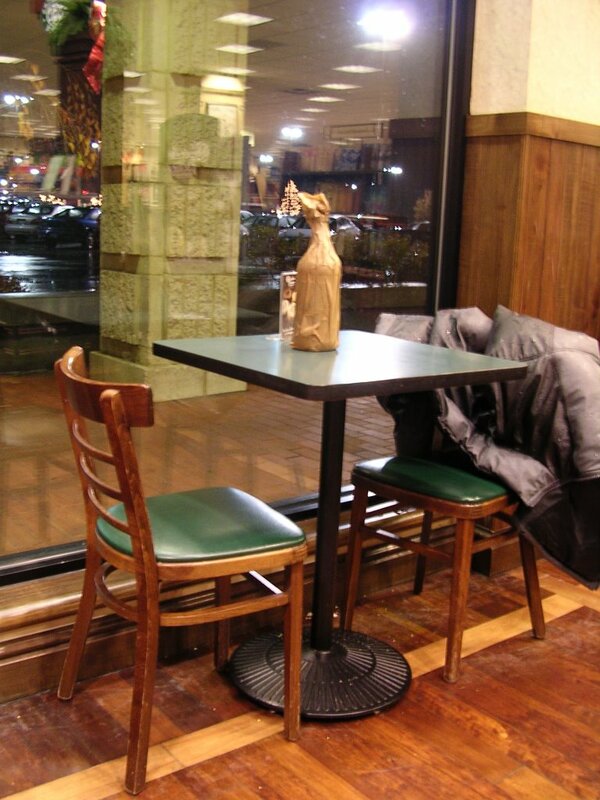 Tuesday evening my mother and I went to meet with the florist for the wedding. He was delightful, and his dog sat in on our meeting and was just adorable (just go take a look). My dad was out of town and my mom was all alone, so I stayed at her place and we had a little girls' slumber party. Since I couldn't very well take her Clapotis to work on, I finished my first Pumpkin Pie Sock (pictures to come). The other holiday gifts are coming along. I have a little less than two straight rows repeats left on the Clapotis before I can start decreasing. I'm also probably 2/3 done with the first giant -- and I mean giant! -- sock that will be felted for the brother-to-be. I also started socks for my dad, simple basic stockinette ones in a muted blue (same pattern as these). I know the photo quality isn't wonderful (I had to scan it, so it'd be all blurry if it's enlarged at all), but you can clearly see that there is plenty of room for him to grow. 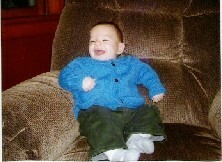 Is this a happy baby or what? That's all the knitting content I got for tonight. I'm off to go do the happy dance, eat my extremely gourmet dinner of mac and cheese, watch celebrity Jeopardy!, and try to get through the rest of those straight rows. I may look like a blue marshmallow, but I'm warm! 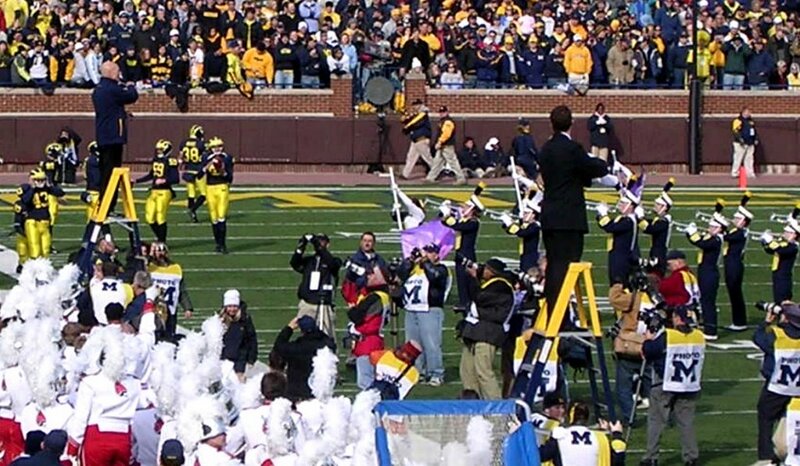 See the bald guy up on the ladder on the far left? 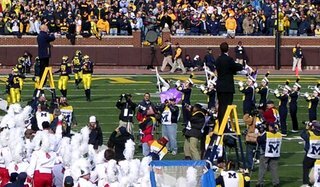 It's a little hard to see since we were so far away (I enlarged the picture a bit), but that's no less than Patrick Stewart! Yes, Captain Jean Luc Picard himself (or Professor Xavier, if you prefer). In addition to the game, we also had dinner two nights with brother and his two friends, who were also visiting for the weekend. 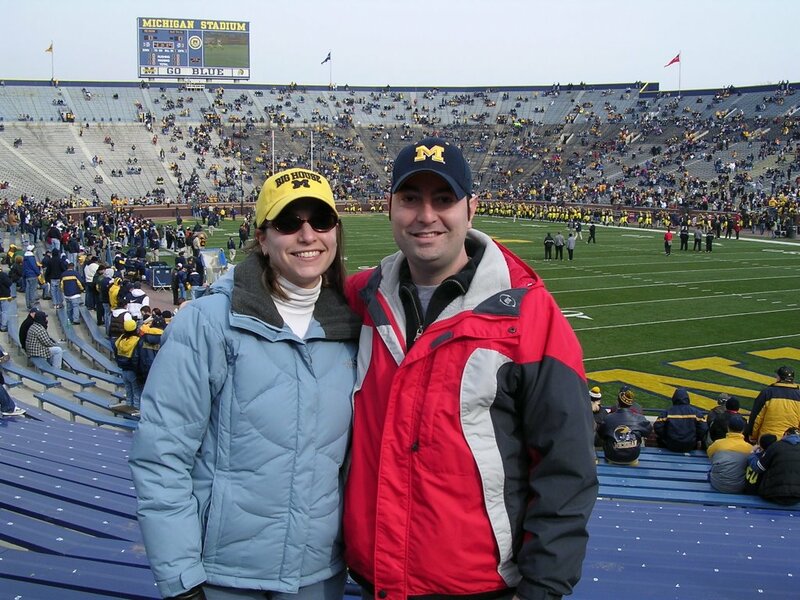 Sure made the two of us feel old, hanging out with those young people (or perhaps young by proxy?). We also were able to meet my aunt and uncle for brunch yesterday before we headed home. I, for one, didn't sleep that much, but it was a fun weekend. Yes, I know this isn't a great shot; my personal photographer left for Chicago for the week again today, so you're stuck with my trying to get a good angle of my own leg. As you can see, the first sock is almost done, and it fits perfectly. And before you start leaving me a comment telling me that my leg looks all lumpy -- those are the little yarn bobbins of the ends I have to weave in once the knitting is done. Which it should be shortly (roughly 1/2" more of the pumpkin and then the toe in cream). I'm very pleased with how these are turning out, especially as all the math I did to create the pattern seems to be working out. I can't really give you the pattern, as it's made to fit my legs/feet, but if anyone is interested I'll be happy to write up the steps to create a custom-fit sock pattern. Just let me know by leaving me a comment (c'mon, you know you want to!). Final thought for tonight: Unless you're living under a rock (or in another country), you should know what tomorrow is -- and I don't just mean the end of all those annoying campaign ads. Consider this a public service announcement and a friendly reminder to exercise your constitutional right to vote. I don't care who you vote for, just VOTE! 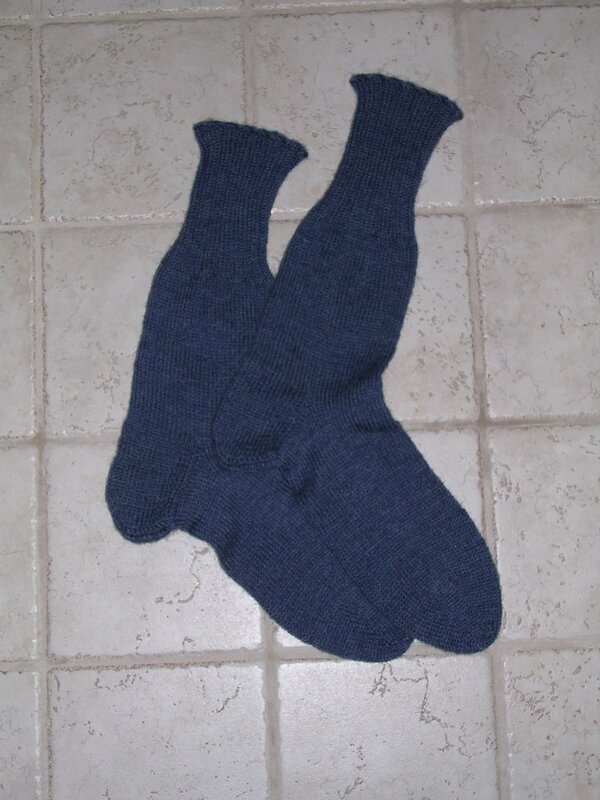 These socks were the first pair I knit at the same time on both needles. I see the appeal (i.e., a distinct lack of Second Sock Syndrome), but these were not portable at all -- which in my opinion is part of the appeal of the sock as a knitting project -- and I felt like I spent a lot of time moving things around and making sure my two skeins of yarn weren't getting tangled with each other. I may or may not do the two socks on two circs thing again. This is a great looking pattern, but not the fastest. The lozenge pattern (sort of a faux argyle) is created by purl stitches in a field of stockinette. It's the perfect "man pattern" for those bored with nothing but stockinette and plain ribbing -- subtle and not too fussy. I think J would wear these, and that's saying a lot. Unfortunately, he won't get to, as they're for his stepfather. I'd say I'm in pretty good shape. 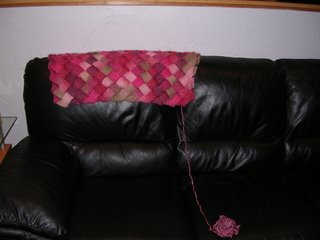 I think I can probably finish my mom's Clapotis this weekend, provided I make good use of my knitting time in the car. My father's socks are going to be pretty plain -- a ribbed leg and stockinette foot (he's not a fancy shmancy guy). 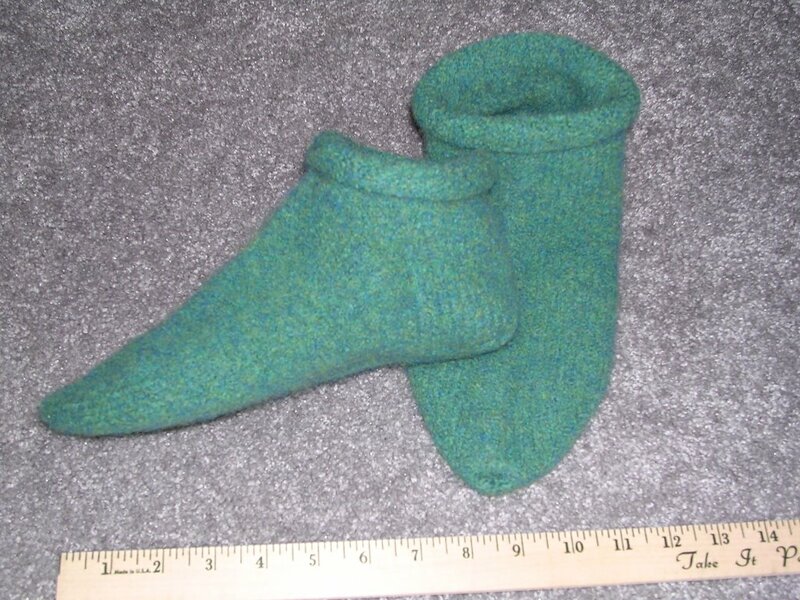 The felted slippers are being knit on US 8 dpns, so they will go quickly. And I'm keeping Lady Eleanor near the bed, so I can usually get at least a row done during the last hour of TV before going to bed. J comes home from Chicago tomorrow (hooray!) 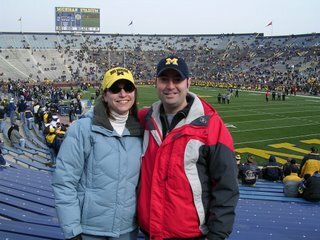 and then Friday morning we're headed to Ann Arbor to visit my baby brother (I can no longer call him little, as he's almost 6'2"). 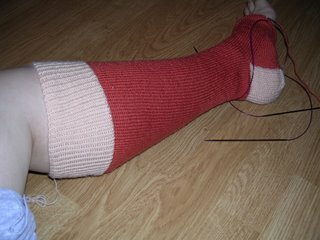 Progress report on the aforementioned projects, and perhaps a peek at the Pumpkin Pie Knee Highs, when we return. A final thought for tonight: when my alarm went off this morning, I was dreaming that I was knitting something in fair isle. Besides the fact that I've never tried to do this, in the dream I was also easily knitting continental (I knit English). What do you suppose this means?